Today, consumers have access to a wide range of choices from private businesses that help save them time and money. People can deposit a cheque with their phone, make bill payments online, or book home maintenance services 24 hours a day, seven days a week from a number of different companies competing for their attention. Businesses must take nothing for granted and always put the customer first because, if they don’t, customers will take their business elsewhere. For too long, government has had difficulty embracing this kind of customer service. People receive a different consumer experience from government than they receive elsewhere, whether it is waiting in lines to renew their driver’s licence or health card, jumping through hoops to access their own health data or having to navigate multiple ministries to get the necessary approvals to start a business. Hard-working people are forced to take precious time out of their busy days, time away from their job, their business or their family to work around the government’s schedule. Government has never had to implement the level of customer service that is widespread in the private sector because it has only ever had to compete with itself. It has not kept pace with technological innovations and new customer experiences that best serve modern, working individuals, families and businesses in Ontario. Ontario’s Government for the People is taking action to free up resources from the back office and focus them on improving the experience for the government’s customer, the taxpayer. Whether it’s public transit or auto insurance, the government will ensure the experience of real people is top of mind in every decision made. It will increase choice and convenience across government, whether it is as profound as child care decisions, or as straightforward as picking up a case of beer for the weekend. It will work to embrace technology and make government more digitally enabled and user-friendly, while promoting simple, easy-to-understand language. To restore trust, the government must work harder to deliver better services, improve consumer choice and convenience, and put people first, at the centre of everything it does. The government’s commitment to delivering a “Government for the People” will always be more than a slogan. Instead, it is a statement that government must always strive to meet and exceed the expectations of the people it serves. Government services should never depend on who you know or how much you are prepared to pay. This government will always remain responsive to the millions of people in the province who have neither the money to hire expensive lobbyists nor the time to engage in full-time professional protesting. Instead, the Ontario government will make a shared promise to the people: that we are working for the people. This means that the entire public sector will be united by a shared recognition that it is responsible for providing the people of Ontario with a better government experience that is focused on their needs. People expect a forward-thinking government that is trustworthy and knowledgeable, a transparent government that can be relied on to spend taxpayers’ dollars wisely, and a caring government that understands and responds to people’s needs without making them jump through complicated hoops. Across every single touch point with the government, people deserve to feel understood, supported, respected and empowered. Delivering this higher level of service will require an all-of-government effort that will include putting people before bureaucracy and replacing long wait times and complexity with simple, reliable and consistent customer service. The government must ceaselessly look for opportunities to deliver greater value along with a simplified, straightforward and responsive customer experience. All of this work will be delivered with an understanding that the government will measure its performance and be held accountable for its results. The government intends to deliver a new visual identity directive across the entire public sector that will explicitly prohibit the spending of taxpayer dollars on new logos or other visual identifiers going forward. 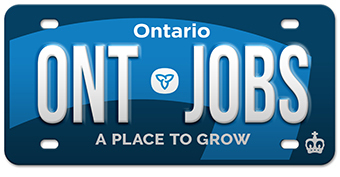 Since 2011, the ministries and agencies of the Ontario government wasted more than $2 million on visual identity work that only served to fragment the Ontario government’s brand and confuse the public about what it stands for. Existing visual identifiers will be retired and replaced by variations of a flexible and adaptable brand system based on the new Trillium. This will be done in a “no-waste” manner to allow different bodies to exhaust their pre-existing brand collateral before adopting the new standard. Revenue-generating government bodies with existing brand identities will be managed on a case-by-case basis. The Province is keeping its promise to build better public transit — delivering more transit services faster — and to save taxpayers’ dollars by forging new partnerships. The government is improving the transit experience and making life easier for the people of Ontario. This government wants to keep people and goods moving by improving its transportation network. Whether for roads or transit, this government will partner with municipalities to build the type of transportation infrastructure that best serves the needs of each community. For the workers and families who live in Ontario’s larger urban centres, few public services impact their lives more directly than public transit. When public transit is reliable, efficient and accessible, it reduces the congestion burden on roads and highways and helps contribute to a cleaner environment. The expansion of transit networks opens up more opportunities for families who live in underserved communities. An efficient, effective transit system also allows people to get to and from work quickly and efficiently, allowing them to be more productive at their jobs and, most importantly, ensures they can spend more time with their families. The government will continue working to build transit and expand service as part of an integrated transportation system. Ontario is investing in provincially owned projects, such as the GO Rail Expansion Program and the Eglinton Crosstown Light Rail Transit (LRT) project, and supporting municipal transit priorities across the province, such as Stage 2 of the Ottawa LRT project. In addition to these commitments, the government has prioritized new infrastructure investments and is moving forward with transit projects that will bring benefits to communities. These targeted investments will help manage congestion, allow seamless connections across municipalities, enable regional economic competitiveness and productivity, and signal that Ontario is open for business and open for jobs. The regional transportation network — both roads and public transit — in the GTHA is congested during peak times. To ensure the GTHA continues to grow, prosper and function as a single integrated region, investment will be needed in transportation capacity to provide reliable mobility between its key population and employment centres. The rail network at present is only realizing a fraction of its potential capability. However, through the GO Rail Expansion program, the Province is transforming the GO Transit rail network into a comprehensive, all-day rapid transit network. The GO Rail Expansion program plans to provide two-way, all-day service every 15 minutes over core segments of the GO Transit rail network which is shown in Chart 1.9. These improvements will provide greater access to GO Transit and enable seamless rail travel throughout the GTHA. The Province is already undertaking infrastructure work to help expand GO Transit rail services. Across the network, capital projects such as track work, rail maintenance, noise walls and grade separations are well underway. The next stage of delivering the GO Rail Expansion program will take place throughout 2019. Metrolinx will be moving forward with critical procurements, including additional infrastructure work along the corridors and at the stations. The Province will look to the private sector to propose innovative approaches to meet future GO Transit rail service levels, including opportunities for technology that could be used to electrify core segments of the GO Transit rail network, such as an overhead catenary system or hydrogen fuel cells. Ontario is moving forward with a new kind of partnership with the private sector to optimize the use of government-owned land and increase transit ridership. The market-driven, Transit-Oriented Development Strategy will leverage third-party investment to reduce provincial funding for transit expansion and offer new opportunities to deliver more transit services faster and at a lower cost to taxpayers. For example, allowing developers to build above transit stations in exchange for building new transit infrastructure can help create mixed-use communities around stations and allow people to travel to and from their homes easier. This is part of the government’s plan to unlock greater value from its assets, reduce the burden on taxpayers and promote residential development close to transit. The new Mimico and Woodbine GO stations will be the first of many projects to be delivered using this strategy. These initiatives put transit users and taxpayers first by delivering modern GO Transit rail stations at no cost to taxpayers. Partnering with third parties to deliver critical infrastructure provides the government with the flexibility to direct infrastructure funds towards other needs. In October 2018, the Province signed a Letter of Intent with VANDYK Group of Companies to negotiate the construction of a new station to replace the existing Mimico GO Station. In exchange for the right to build above the new station, the developer will pay all of the costs associated with the construction of the main station building, new underground parking and improved connections to the local community. This arrangement provides value to the Province by saving taxpayers money and supporting the future revitalization and redevelopment of the Mimico-Judson area. 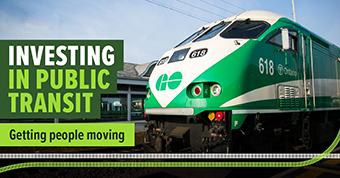 In March 2019, the government partnered with Woodbine Entertainment Group to develop and build a new GO Transit rail station along Highway 27 near Woodbine Racetrack on the Kitchener GO rail line. This arrangement is expected to save taxpayers money and bring in an estimated $94 million in revenue over the life of the new station. This new station will increase access to employment opportunities in a major employment area while enhancing transit access to a major sporting and entertainment destination. The government is committed to delivering quality service for its GO Transit customers in the same way that a business would need to, in order to attract customers and be competitive. The government recognizes the need to strive for improvements and to provide convenient and accessible services. It is clear that the status quo is not an acceptable blueprint for the future. GO Transit needs to evolve and innovate to make customer journeys more convenient and comfortable. That is why, to complement the Transit-Oriented Development strategy, the government is looking at the feasibility of flexible food and beverage services across the GO Transit rail network, for example, coffee shops or other retail points of sale for commuters — opportunities that could meet customer needs while maximizing the value of stations. The government continues to deliver on its commitment to improve the customer experience throughout the GO Transit network, with benefits that extend to communities across the region. The government is putting families first. As of March 9, 2019, children age 12 and under travel free of charge on all GO Transit trains and buses. This means families will have an affordable, low-stress option for seamless and convenient travel throughout the Greater Toronto and Hamilton Area. Long-asked-for year-round weekday GO Transit rail service to Niagara Falls and St. Catharines on the Lakeshore West Line, four years ahead of the committed service date. The official PRESTO app became available for download in January 2019, allowing users to view, manage and load their PRESTO cards using their smartphone. On February 12, 2019, the Province of Ontario and the City of Toronto agreed to a Terms of Reference that advanced the conversations about completing the upload of the Toronto Transit Commission’s (TTC) subway network to the Province. As part of this Terms of Reference, the City of Toronto agreed to share data related to both the existing assets within the subway network and future expansion plans. The subway upload, once completed, would benefit people by reducing congestion, improving everyday commutes and allowing for a truly integrated regional transit plan for the GTHA. Most significantly, the upload will enable the Province to leverage its track record of infrastructure delivery to build the new subway transit plan better, faster, and more cost effectively. Metrolinx and Infrastructure Ontario have a history of on-time and on-budget delivery of major capital projects. The Province has tools to expedite planning and construction through various legislative and regulatory mechanisms and can enable true transit-oriented development through partnerships with the private sector. Ultimately, talks between the City and the Province have progressed rapidly, particularly in connection with responsibilities for expansion. With this Budget , the Province is unveiling a new subway transit plan for the City of Toronto and the broader GTHA (see Chart 1.9). The subway upload is proposed to be completed in two parts: first, legislation will be introduced this spring session to upload responsibility for all subway extensions and new lines — including the ones listed in Ontario’s new transit plan. This fulfills the Province’s commitment to introduce legislation pertaining to the upload in 2019. As part of the second phase of the upload, discussion will continue between the City and Province under the Terms of Reference to determine how best to accomplish the upload of the existing network, with further legislation envisioned for 2020. The Province remains steadfastly committed to the full upload of the TTC subway network. The Province would simply not have had the confidence to make such sizeable financial contributions to subway projects without knowing that they were going to be delivered in a timely, cost-effective and properly designed way. The upload also enables the Province to make even larger financial contributions to new subway projects, subject to the confirmation of the accounting impacts by the Auditor General of Ontario. Under municipal ownership, Provincial contributions to the City would have had an adverse effect on the Province’s books, whereas provincial ownership of the assets would allow the Province to amortize its capital contributions, thereby treating subway builds in the same manner as other provincially owned infrastructure projects, such as hospitals and schools. This ownership transaction ultimately creates the fiscal space to allow the Province to significantly deepen its commitment to transit and start projects immediately, not sometime in the distant future. The Province is not presupposing the outcome of the discussions with the Auditor General of Ontario and will continue to work in very close collaboration. The Province, for the first time, is taking a true leadership role in building new transit by making the single largest capital contribution to new subway builds and extensions in Ontario’s history. The Province is planning to build four projects, as described below, with a total preliminary cost estimate of $28.5 billion. The government will commit $11.2 billion towards these projects. This is more than 35 per cent of the construction cost. This significantly over-delivers on the government’s commitment to inject an additional $5 billion in capital funds into subway extensions. In addition to provincial funds, the Province and the federal government have reached an agreement on the terms regarding the use of Investing in Canada Infrastructure Program (ICIP) funds for these subway projects. The federal government has confirmed that ICIP monies can be used for subway projects, regardless of underlying ownership and has further confirmed that it will invest up to 40 per cent of the cost of eligible projects. This means that the $4.2 billion allocated under ICIP for transit infrastructure in Toronto could be used for eligible subway projects, in addition to the $660 million already allocated to the Scarborough Subway Extension by the federal government. Furthermore, the federal government has indicated flexibility in reallocating monies from the $2.25 billion Green Infrastructure Stream to the Public Transit Stream. Given the obvious ability of subway projects to reduce greenhouse gas emissions, the total funding potentially available from the federal government to support subway construction could be just over $7 billion. The Province will continue to work with the federal government in the hopes that it will further increase its funding, consistent with a 40 per cent contribution to all new builds. The Province will also engage the City of Toronto and York Region, where applicable, to negotiate the exact contribution levels from these municipalities to Ontario’s new transit plan, in addition to the federal and provincial monies mentioned above. The Province expects the federal government, the City of Toronto and York Region to make significant capital contributions to what will be the largest investment in subways in Canadian history. It is important to note that, for prudence, no assumptions are being made about private-sector contributions to projects, via transit-oriented development partnerships, or other forms of land value capture. The Province is deeply committed to learning from the experiences of other jurisdictions and defraying the cost of new builds through a well-designed program of partnerships. The Province has considerable expertise in planning, designing and delivering transit projects. When this expertise is combined with the Province’s unique ability to expedite construction through various legislative and regulatory measures, the Province is uniquely positioned to create a more functional version of the Downtown Relief Line — a project that everyone wants built. Extend the west terminus of Osgoode Station through the King and Bathurst downtown core to a new terminus station at Ontario Place. This new route would create more meaningful point-to-point journeys for users, help deliver true relief to the existing overcapacity of the Yonge-University-Spadina Line and unlock massive new development potential. 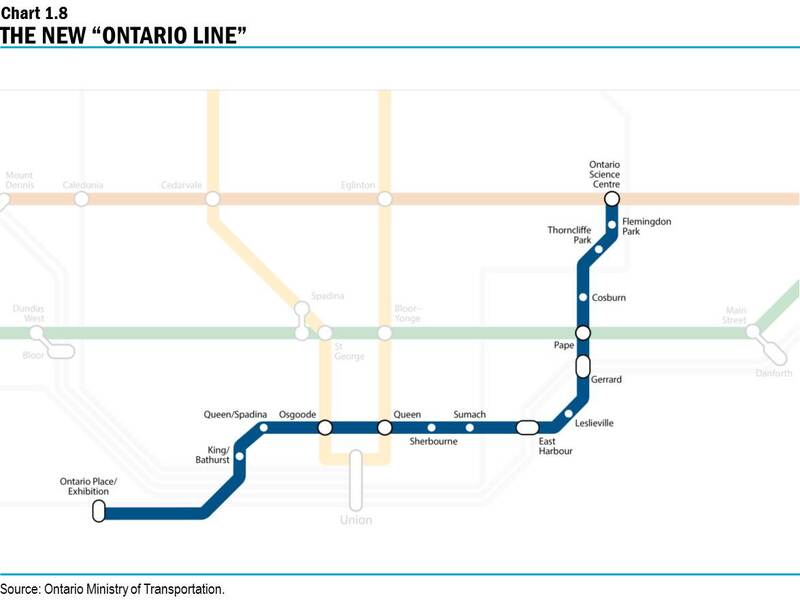 The government believes that the new Ontario Line could be operational well in advance of the 2029 target set by the City for the Relief Line South project. Subject to market bids, it may be possible to deliver the project two years earlier, presuming a smooth transition of design responsibility from the City to the Province, and a continuing partnership between both levels of government to expedite construction using all the tools at their disposal. The preliminary cost estimate for this project — including the additional kilometres of track, new stations, rolling stock and a storage yard — is $10.9 billion, subject to market bids. The Ontario Line is expected to represent more quality and service at a cost that is incrementally higher than the current publicly estimated budget for the Relief Line South project, and in all cases, would be cheaper than what the Province anticipates to be the City’s revised estimate. An aggressive early works program, leveraging the Province’s unique ability to expedite approvals and enabling works, with a target to have shovels in the ground by the end of next year. The Province is also committing to the full completion of the Yonge North Subway Extension, stretching from the existing terminus at Finch Station to Richmond Hill Centre. The extension could help create a truly regional transit system by further extending the Yonge Line outside of Toronto to Richmond Hill and Markham for the first time. The new line would cost an estimated $5.6 billion and could be constructed at the same time as the Ontario Line. It could be opened by 2029–30, following completion of the Ontario Line. To better utilize the Yonge North Subway Extension, the Province will also undertake measures in the immediate term to reduce congestion on the Yonge-University-Spadina Line by better utilizing and promoting the use of the existing Richmond Hill GO line and evaluating the retrofit of the Bloor-Yonge Station. The Province plans to complete the Scarborough Subway Extension as originally conceived — delivering to the residents of Scarborough the subway service they have been denied for too long. This project would include three stops — Lawrence East Station, Scarborough Town Centre Station and McCowan Station — instead of the currently planned one-stop subway extension that has been relitigated in the City of Toronto numerous times. The estimated completion date of the three-stop Scarborough Subway Extension is 2029–30. Presently, the City is focused on a one-stop extension that has an estimated cost of about $4 billion, which has been adjusted for inflation. The Province has estimated that a three-stop extension would cost an additional $1.5 billion, for a total cost of $5.5 billion. The Province has committed $2 billion, and the City is expected to contribute an estimated $1 billion to the one-stop extension, to be adjusted for inflation. The federal government is expected to keep its commitment of $660 million along with an equal share, with the Province, of any remaining incremental costs. As is the case with the Relief Line South project, City officials recently advised that the true cost of this project will significantly increase relative to the figures released publicly. The Province has called upon the City to confirm its revised estimates immediately. The Province is also committed to extending the Eglinton Crosstown Light Rail Transit project further west into Etobicoke to increase connectivity along Eglinton Avenue to Renforth Drive. As part of this commitment, the Province would put a portion of the Eglinton Crosstown West Extension underground, primarily between Royal York Road and Martin Grove Road. Ultimately, through future phases of this project, the Province is committed to establishing connectivity with Pearson International Airport. The total preliminary cost estimate of the extension to Renforth Drive is $4.7 billion, and the Province will look to the City and federal government for their contributions. This project has an estimated completion date of 2030–31 and could be delivered using a Design-Build-Finance-Maintain model consistent with the one used for the Eglinton Crosstown project, which is currently under construction. 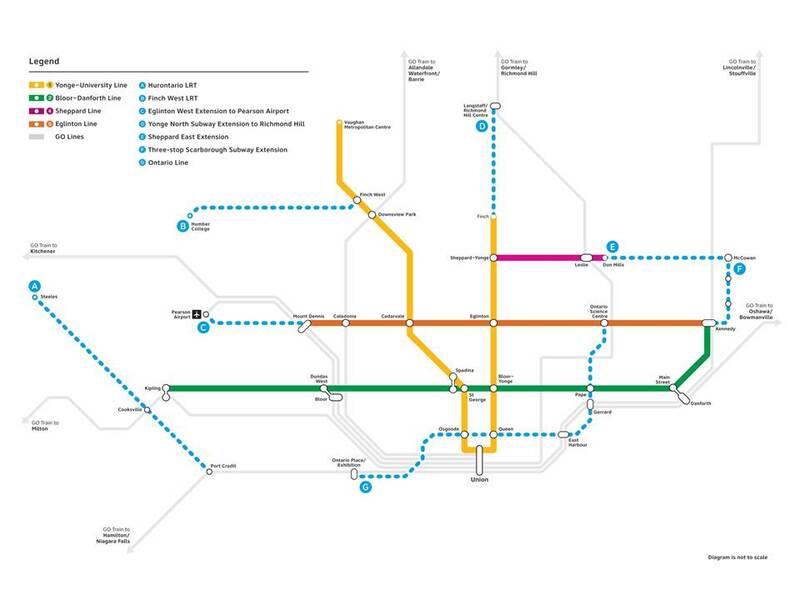 The Province also remains committed to the Sheppard Subway Extension to connect the existing terminus at Don Mills Station with the future terminus of the Scarborough Subway Extension at McCowan Station. As this line has not been a part of an official transit plan for some time, the Province will begin exploratory work on cost and on completion timelines to lock in the project for a future build date, following the completion of the Scarborough Subway Extension. To facilitate the work needed to build each of the above transit lines immediately, the government has allocated additional funds associated with planning and design within its capital plan. The Province will examine options for improved connections between London, Kitchener and Toronto to spur economic activity in the region by improving mobility and increasing travel reliability. This will include practical options for improvements to existing rail corridors in collaboration with private-sector partners to optimize passenger and freight rail. As well, it will include improvements to the highway network and inter-community bus services. As part of this work, the Province will consult with affected municipalities and Indigenous communities. High-speed rail: value for money? The Province has paused capital funding for high-speed rail in the 2019 Ontario Budget and is actively exploring opportunities to enhance the train speeds and service levels on existing railway corridors, as well as opportunities for inter-community bus services or other transit solutions that better support the immediate needs of Southwestern Ontario. The Province has listened to the residents in Southwestern Ontario who have expressed concerns that high-speed rail would have negative social, environmental and economic impacts for the region. For example, the agricultural community has warned that the project would create a physical barrier that would eliminate countless hectares of prime agricultural land in one of Canada’s richest farm belts, restricting access to homes, fields and markets. The Province will bring forward a transportation plan for Southwestern Ontario by fall 2019. Ottawa Light Rail Transit Stage 2: Approximately $1.2 billion towards an expansion of the city’s O-Train network by adding 44 kilometres of rail and 24 new stations. Stage 2 will extend the Confederation Line east to Place d’Orléans and Trim Road, and west to both Moodie Drive and Algonquin Station. The Trillium Line will be extended south from Greenboro Station to Riverside South, with a link to the Ottawa Macdonald-Cartier International Airport. Hamilton Light Rail Transit: $1 billion towards 14 kilometres of new light rail from McMaster University through downtown Hamilton to Eastgate Square, including 17 stops. Additionally, the government will continue to review initiatives to meet Northerners’ transportation needs, including passenger rail. See Chapter 1, Section D: Open for Business, Open for Jobs for more details. The provincial highway network is essential for creating jobs, improving quality of life for workers, families and small businesses across Ontario, and supporting a globally competitive economy. This is particularly true in rural and small-town Ontario, where highways are often the only transportation option available. Road construction and maintenance encourages job creation and trade, plays a significant role in the social and economic well-being of residents and contributes to a higher quality of life. The government takes the responsibility seriously to ensure Ontario’s highways are safe and reliable for the hundreds of thousands of people who drive on them every single day. Four-laning sections of Highway 69 and Highway 11/17 in the North, including stretches between Kenora and the Manitoba border. Rehabilitating westbound core-collector lanes between Neilson Road and Wilson Avenue in Toronto, and eastbound core-collector lanes between Neilson Road in Toronto and Whites Road in Pickering. Several bridge rehabilitation projects in Peterborough. Over the next few months, the government will consult with municipalities to review the program parameters and identify opportunities for improvement. This review will be informed by the goals of responsible planning and a more sustainable government to ensure taxpayer dollars are being spent as effectively as possible. Over the past 30 years, Ontario’s auto insurance system has gone through a series of ineffective patchwork reforms implemented by different governments. After each reform, costs came down temporarily, only to rise again. Auto insurance rates in Ontario are now higher than they were a decade ago and have been among the highest in the country since 2013. Ontario drivers deserve better. This is why Ontario’s Government for the People is going to invest the time and effort required to implement an effective, sustainable auto insurance system that actually puts drivers first. In contrast to the ineffective changes that were brought forward by the previous government, this government will take the time to get it right for the benefit of all Ontario drivers. Every driver in Ontario recognizes the need to carry auto insurance. At the same time, many drivers are left frustrated and confused by an expensive and convoluted auto insurance system in which the rates they are required to pay seemingly fail to reflect their driving record or individual needs. And during those unfortunate times when drivers do need to make an insurance claim, they are left at the mercy of a system that often seems to cater to lawyers or insurance companies, rather than to the victims it is supposed to help. Ontario’s Government for the People is making transformative changes to the province’s auto insurance system that will put drivers first and put money back in people’s pockets by lowering costs, increasing consumer choice and increasing competition in the auto insurance market. Earlier this year, the government reached out to hear from Ontario drivers about their experiences with auto insurance, and tens of thousands of people responded. The government heard that premiums are too high and that buying auto insurance is frustrating. Drivers said they find it difficult to understand their options and they do not have enough choices. They also said the process of making a claim and accessing benefits after an accident is too complicated. The government’s vision for a modern auto insurance market is focused on making auto insurance affordable and accessible. 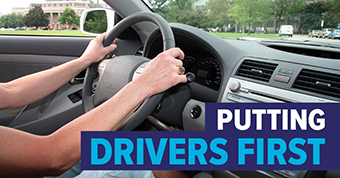 Putting Drivers First is the government’s blueprint for Ontario’s auto insurance system. The proposed reforms will give control back to drivers by increasing the range of auto insurance coverage choices available to them, thereby giving them the power to lower their premium costs. The government will increase convenience by making it easier for consumers to shop for and buy insurance. It will also increase competition in the auto insurance market, thereby creating opportunities for savings that will make life more affordable for Ontario’s 10 million drivers and their families. 53% said it takes too long to receive benefits after being injured in an accident. The government made a commitment to work for families and to respect their hard-earned dollars. Auto insurance should be affordable, easy to understand and easy to buy. The blueprint focuses on lowering costs, finding efficiencies and fighting fraud to ensure that drivers’ auto insurance premiums pay for the health care services they need after an accident, rather than for costly and unnecessary disputes. Reform the flawed medical assessment process to bring credibility and accountability to the assessments that injured claimants must undergo after an accident. The government will also work with the Law Society of Ontario to make contingency fee agreements more transparent for injured claimants who choose to hire a lawyer. As part of this work, the Province will evaluate the effectiveness of the current contingency fee arrangements to ensure consumers are being fully protected. Making it easier for insurance companies to offer more discounts and options to consumers. Ontario’s drivers should have more choice when deciding which auto insurance coverage suits their needs. They also deserve to have the same convenience that they have come to expect from modern financial institutions, such as banks and credit unions. The government’s Putting Drivers First blueprint will give auto insurance companies the flexibility to offer drivers more choices in terms of discounts and coverage options to make their insurance policy more affordable. For example, drivers should have the choice to lower their premiums by allowing insurers to consider their credit history, or by agreeing to use preferred providers of auto repair or health care services. To make the consumer insurance experience simpler, the government is introducing legislation that, if passed, would allow insurance companies to use electronic communications and electronic commerce to do business with their customers. Ontario drivers will soon be able to use an electronic proof of auto insurance, allowing them to benefit from the same ease and convenience already offered in many other North American jurisdictions. Auto insurance forms, policies and other related documents will also be simplified so that drivers will find it easier to understand the coverage they need and make informed decisions about what they are buying. People hurt in auto collisions are too often not receiving timely access to care, and they find it difficult to navigate the claims process and understand the benefits available to them. They can take longer than they should to recover from their injuries because of disputes over benefits and appropriate treatment. The government is putting drivers first by focusing on care for people injured in collisions and making sure that they can access treatment faster. A return to the default benefit limit of $2 million for those who are catastrophically injured in an accident, after it was previously reduced to $1 million in 2016. A competitive auto insurance market benefits consumers. Making Ontario open for business is one of the government’s key commitments. Ensuring that businesses can compete while encouraging new companies to enter Ontario’s auto insurance marketplace is a key element of the government’s blueprint for the province’s auto insurance system. The government will encourage innovation and reduce the regulatory burden, enabling insurance companies to better serve their customers and invest in Ontario. Working with the Civil Rules Committee to increase the monetary limit for simplified procedures, and reduce the costly and time-consuming use of civil juries for simplified procedure trials. The Putting Drivers First blueprint will address key issues identified in David Marshall’s 2017 report on Ontario’s auto insurance system. It will improve choice and convenience for consumers and give them more control over their auto insurance rates and coverage. It will also combat fraud and increase competition, resulting in lower system costs to ensure that Ontario families' hard-earned dollars pay for the care accident victims need, when they need it. Lifestyles have changed — people are busier and expect more flexibility and convenience. Alcohol reform is something long-desired by the people of Ontario. The government is committed to respecting adult consumers by trusting them to make responsible choices that work for them. Ontario’s beverage alcohol retail system is largely controlled by a few enterprises. The rules around the retail sale and consumption of beverage alcohol in Ontario are outdated and unique in Canada, imposing unnecessary burden, restriction and complexity on Ontario businesses. While there is an existing and diverse network of stores selling beverage alcohol in the province, Ontario has the lowest density of retail outlets selling beverage alcohol of all the provinces in Canada. As a point of comparison, there are over 8,000 retail stores in Quebec selling beverage alcohol, but less than 3,000 in Ontario. As such, Ontario’s Government for the People is moving forward with the promise to improve consumer choice and convenience, and to create more opportunities for businesses. 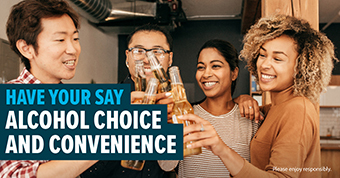 The government heard from over 33,000 consumers and businesses that shared their views on how beverage alcohol choice and convenience could be increased in the province. Feedback from the consultations will inform the government’s plan to transform alcohol sales. In December, the government launched a public consultation as part of its commitment to transform the sale and consumption of beverage alcohol. The government heard from over 33,000 consumers and businesses that shared their views on how beverage alcohol choice and convenience could be increased in the province. The government also invited key groups, including those representing beverage alcohol producers, public health and safety organizations, retailers, restaurants and bars, to participate in roundtable discussions to ensure their valuable advice helps inform this review. The government is listening to the people of Ontario. Feedback from the survey and roundtable discussions will inform the government’s plan to expand the sale of beverage alcohol to corner, grocery and big box stores. Opportunities for business: to enable many more opportunities for the private sector to compete in the sale and distribution of beverage alcohol. While the government delivers on these principles, the safe and responsible sale and consumption of alcohol in Ontario is, and will continue to be, a top priority. Creating a tailgating permit for eligible sporting events. Eligible events would include professional, semi-professional and postsecondary sporting events. This change will allow Ontario sports fans to participate in legal tailgating events similar to those permitted in many U.S. states. Introducing legislation permitting municipalities to designate public areas, such as parks, for the consumption of alcohol. Ontario would be joining other provinces, including British Columbia, Alberta and Quebec, that provide a similar authority to municipalities. Extending hours of alcohol service at licensed establishments — including bars, restaurants and golf courses — to a 9:00 a.m. start, seven days per week. Hours of alcohol service will also start at 9:00 a.m. for “by the glass” licences, and Special Occasion Permits. The government will continue consulting further on measures related to the additional extension of hours. Changing advertising rules to allow for “happy hour” in Ontario. This would allow licensed establishments to advertise their promotions as they do in British Columbia and Alberta. Introducing legislation to pause the previous government’s changes to the Wine Tax, which was scheduled to increase on April 1. The proposed change would leave more money in the pockets of Ontario wine consumers. These changes are expected to be in place by summer 2019. In addition, the Province is evaluating ways to reduce the cost of beer at the Royal Canadian Legion halls by fall 2019. These changes will improve choice and convenience, and provide more opportunities for businesses. They will also allow consumers to make the responsible choices that work best for them. Last year, the Province launched the “Buck-a-Beer Challenge” to brewers. The Province has enabled all beer producers to sell beer for $1 at all times, including on long weekends and holidays in Ontario. Since this initiative launched on August 27, 2018, the people of Ontario have purchased more than 76,000 cases, totalling about $1.6 million in sales. Consumers can continue to purchase buck‐a‐beer products at select LCBO locations and online on holiday long weekends. It is time to usher Ontario out of the gambling prohibition era and treat the people of Ontario as adults by allowing them to bet on the outcome of a single sporting event. As consumer preferences continue to evolve, many Ontarians gamble using grey-market websites. Today, Ontarians spend an estimated $500 million a year gambling online, with most of that money spent on illegal websites. As a result, the Province intends to establish a competitive market for online legal gambling that will reflect consumer choice while protecting consumers who play on these websites. This will ensure the people of Ontario have access to safe and legal gambling options. The Province plans to consult with key stakeholders to develop a market that reflects consumer preferences, fosters an exciting gaming experience and minimizes the burden on business while ensuring appropriate protections are in place. A key part of the government’s customer-focused strategy for gambling is the legalization of single event sports wagering. The Province has asked the federal government to make this change and will continue to pressure it to stand up for Ontario consumers. Consumers have long asked for ending the prohibition on single event sports wagering. It is legal in the United States and is supported by major professional sports leagues in North America. Partnering with professional sports leagues and teams such as the Toronto Raptors to provide customers with world-class gaming experiences and entertainment. In addition, the government will begin allowing casinos to advertise complimentary alcohol. This change will level the playing field for Ontario casinos and enable them to compete more effectively with those in the United States. Many charities rely on revenue from the sale of charitable gambling products as part of their fundraising. To support these efforts, Ontario will eliminate an unnecessary fee applied to the sale of break open tickets, thereby helping charities throughout the province to save more than $4 million a year. Removing unproclaimed and unenforceable provisions to introduce a price cap on ticket resales, which would have driven consumers to buy tickets on the black market and further drive up costs. The Province is committed to protecting the people of Ontario when they make one of the biggest purchases in their lives — a new home. A 2016 report from Justice Douglas Cunningham noted an inherent conflict of interest in the current structure of the Tarion Warranty Corporation (Tarion) that leaves new homeowners vulnerable. Introducing new initiatives to better inform and protect purchasers of cancelled condominium projects. Tarion will continue to provide services to purchasers of new homes as well as new home builders and vendors during the transformation, with greater government oversight. Too many families have had difficulties over the years when seeking a solution from Tarion. These actions will put the people of Ontario first and strengthen consumer protection. It is important that property owners and municipalities have confidence in the fairness and accuracy of property assessments, which are the foundation of the property tax system. To that end, the Province is developing an action plan to further improve the accuracy, transparency and stability of property assessments. Strengthen the governance and accountability of the Municipal Property Assessment Corporation (MPAC), including proposed changes to MPAC’s board structure that would ensure better representation for Ontario property taxpayers. To support a meaningful and informed review process, the government will be seeking input on these issues through consultation with residents, businesses, municipalities and other stakeholders. The government believes that hard-working property taxpayers should be respected and given a stronger voice when it comes to the administration of property assessment to ensure fairness and accountability. Under the leadership of the Member of Provincial Parliament for Markham-Stouffville, Paul Calandra, legislation has been introduced that, if passed, would raise the total number of taxpayer representatives on the Board of Directors of the Municipal Property Assessment Corporation (MPAC). This rebalancing would ensure better representation for Ontario property taxpayers while still maintaining a strong voice for municipalities. The Government for the People continues to fix expensive and confusing electricity programs and is creating an energy system that works for Ontario’s families, farms and small businesses. The government is committed to making electricity bills more transparent and to lowering electricity costs for residential, industrial, farm and small business customers. The Province is providing electricity relief while ensuring transparency and accountability. To this end, the government agreed with the recommendations of the Independent Financial Commission of Inquiry (Commission) and the Auditor General of Ontario on the accounting treatment for global adjustment (GA) refinancing and reflected the cost of GA refinancing as an expenditure of about $1.8 billion in the Public Accounts of Ontario 2017–2018 , and an estimated $2.8 billion in 2018–19. The government also put in place a lower-cost, interim mechanism to have the Province pay for GA refinancing, recognizing that the Province is able to borrow at a lower interest rate than the Fair Hydro Trust. To continue to provide relief on residential electricity bills and hold average residential electricity bill increases to the rate of inflation, the government will introduce a regulation effective May 1, 2019. The government has introduced through Bill 87, the proposed Fixing the Hydro Mess Act, 2019, proposed amendments to the Ontario Fair Hydro Plan Act, 2017, and other Acts that, if passed, would replace the GA refinancing mechanism, effective November 1, 2019, while maintaining electricity rates and providing on-bill electricity price relief more transparently, making it easier for families, farms and small businesses to understand how electricity rate relief is being provided. The Province would make all the required going forward payments for the legacy Fair Hydro Trust debt obligations and remove this burden from future ratepayers. One of the government’s first actions in office was to terminate more than 750 energy contracts. Ontario ratepayers are already benefiting from the government’s decision, which reduces costs by $790 million over the timeframe of the terminated contracts. None of the projects that were terminated had reached the advanced contractual milestones. The government supports Ontario Power Generation’s (OPG) refurbishment project to extend the operating life of the four-unit Darlington Nuclear Generating Station. The Darlington Refurbishment project continues to track on time and on budget and, when finished, will generate low-cost, carbon-free and reliable energy for the people of Ontario for another 30 years. The first refurbished unit is scheduled to return to service in the first quarter of 2020. The refurbishment and continued operation of Darlington is estimated to contribute a total of $90 billion to Ontario’s GDP. Continued operation is estimated to increase employment in Ontario by an average of 14,200 jobs annually, including over 2,600 jobs on-site at Darlington. The government supports the continued operation of the Pickering Nuclear Generating Station until 2024, protecting 4,500 local jobs in the Durham Region and an additional 3,000 jobs provincewide. The continued low‐cost energy generation at Pickering will save Ontario ratepayers $600 million over the period to 2024. Ontario electricity consumers will benefit from approximately $200 million in efficiency payments from operational efficiencies at Bruce Power, putting more than $5 million per month into consumers' pockets over the next three years. The Bruce Power Refurbishment Implementation Agreement with the Independent Electricity System Operator (IESO) will ensure that the people of Ontario benefit from efficiencies realized during the refurbishment and operation of the Bruce Nuclear Generating Station. The Bruce Nuclear Generating Station provides over 30 per cent of Ontario's electricity needs. Direct or secondary impacts from continued operations of the Bruce Nuclear Generating Station are estimated to sustain or increase employment by 22,000 jobs per year and generate $4 billion in annual economic benefits in communities throughout the province. The government continues to work with Hydro One to promote transparency and accountability. Following the retirement of Hydro One’s chief executive officer (CEO) in July 2018 and the resignation of the board of directors in August 2018, the government appointed a new, highly qualified board, and proclaimed into force the Hydro One Accountability Act, 2018 . In February 2019, the government took decisive action to bring Hydro One’s executive compensation in line with comparable utilities. The government issued a directive outlining the government’s requirements for Hydro One’s executive compensation and, in March 2019, the government approved Hydro One’s new compensation framework. Hydro One set a cap of $1.5 million per year in maximum direct compensation for the next CEO of Hydro One. This includes a maximum $500,000 base salary, with performance-based incentives making up the rest. The new framework also sets a total compensation cap of $80,000 per year for board members and $120,000 for the board chair. Other new executive hires are capped at 75 per cent of the CEO’s total maximum direct compensation. Most significantly, the new framework includes performance targets that will include the CEO’s contribution to reducing system costs, which supports the government’s commitment of lowering electricity bills by 12 per cent. Notes: Previous Hydro One Compensation for CEO reflects 2017 target total direct compensation, as of May 4, 2017. Target total direct compensation based on achieving certain performance targets. Actual total direct compensation in 2017 was $6,074,319. Previous Hydro One Compensation for Board Chair and Other Board Members reflects Hydro One director compensation policy, effective on January 1, 2018. Sources: Hydro One Annual Information Form for the Year Ended December 31, 2017 (March 29, 2018) and Hydro One’s New Compensation Framework (February 28, 2019). Additionally, under the Ontario Energy Board Act, 1998, compensation paid to Hydro One executives will not be funded from electricity rates. As it reviews conservation programs, the government is continuing to find savings as part of its overall plan to take costs out of the electricity system. 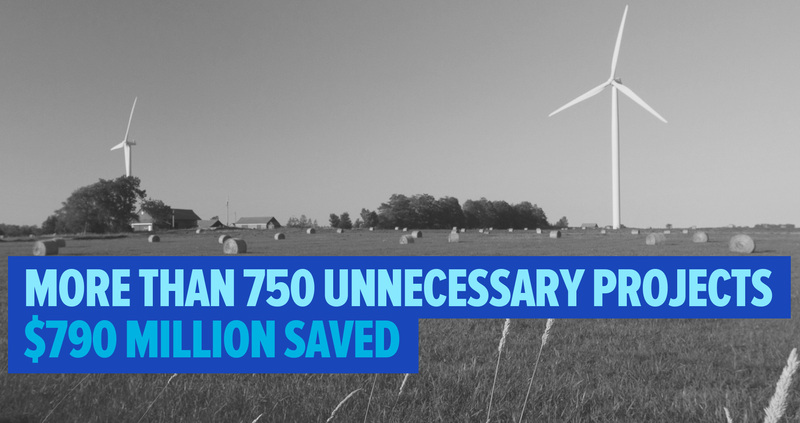 Conservation and energy efficiency programs that are less effective in driving energy efficiency will be phased out, saving up to $442 million. Going forward, the government will focus investments on the most cost-effective and efficient conservation programs. These actions will have long-term benefits for all customers and help the government achieve its broader goal of managing the energy system in a financially responsible way. To make government work better for the people, the Province is moving ahead with a digital strategy that will bring government services into the 21st century by adopting a digital-first approach that has become widespread across much of the private sector. The strategy, as recommended in EY Canada’s line-by-line review, will make Ontario the first province in Canada to require an all-of-government digital approach. As part of this work, the government is improving its digital platforms to make high-volume government services that are already available online easier to use and putting more services available online. The government is starting with enhancing ServiceOntario’s top 10 transactions, which include the issuing of driver’s licences, health cards and vehicle permits. This will shift approximately 10 million in-person transactions to digital channels, saving up to $33.5 million over the next five years. By adopting new digital practices, the government is fixing out-of-date and overly bureaucratic processes and policies that waste time and money, reduce the quality of government services and frustrate the people of Ontario. Digital-first does not mean digital only. The government recognizes that some people prefer in-person service, which is why ServiceOntario centres will be available for those who want to visit them. The service-provider network, which is comprised primarily of individuals and the owners of small to medium-sized businesses throughout the province, will continue to be an important component in serving the people who need and want in-person services. People expect the same best-in-class services, regardless of the type of service they are using. To this end, the government is removing barriers to people-centred policies by introducing the Simpler, Faster, Better Services Act in 2019, which would put people at the centre of government services. Military personnel move frequently, including across provincial boundaries. This can be stressful, especially when moving an entire family. The government wants to make it easier for Canadian Armed Forces members to receive the government services and information they need when moving to Ontario. This is why consultations are underway to inform the establishment of a “one-stop hotline” that will make it easier for military families to receive information on schools, job opportunities, child care, driver and vehicle licences, and other programs and services. The way government handles data also needs to change to drive innovation and allow better decisions to be made while ensuring citizens and businesses can trust the government to protect their privacy. This means the government will fix outdated laws, policies and rules to put people at the centre of government decision-making. 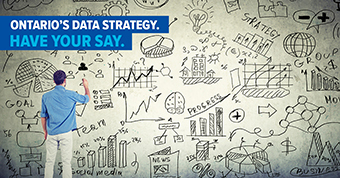 Data is transforming the world around us, and the government needs to catch up. This is why the government is supporting the digital transformation through ongoing consultations on the province’s first data strategy. The strategy will be developed based on citizen and business feedback so that government can create a data policy that will help citizens and businesses harness the value of data. At the same time, the government is committed to ensuring Ontario’s data policy will be transparent and easy to understand because, even though data can be a key economic driver, data privacy and security must remain at the core of government policy. Ontario’s Government for the People is committed to maximizing the Province’s infrastructure and infrastructure investments to benefit all of the people of Ontario. Whether it is building new, or making key investments to upgrade Ontario’s schools, hospitals, roads, bridges and transit, the Province needs to make strategic investments efficiently across government by prioritizing infrastructure activities and unlocking existing opportunities. 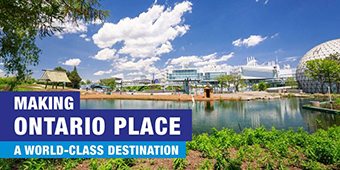 The Province is working quickly to bring Ontario Place back to life and make it a world-class, year-round destination. An Expression of Interest process will begin in spring 2019 to invite ideas and designs from potential partners around the world to help achieve the new vision for Ontario Place. In the meantime, the government is taking immediate steps to help people reconnect with this iconic piece of property on Toronto’s waterfront by partnering with Cirque du Soleil. The internationally recognized company will bring its unique brand of entertainment and artistry to Ontario, and is expected to offer 80 to 90 shows at Ontario Place in fall 2019. The government is committed to promoting Ontario globally as being open for business. The government is proposing to offer Infrastructure Ontario’s advice and services into new markets, including entities outside of Ontario. By better utilizing the professionals at Infrastructure Ontario, the government can help build relationships with international clients and increase opportunities for Ontario businesses to access foreign markets. This is another way the government is making sure that Ontario is open for business. 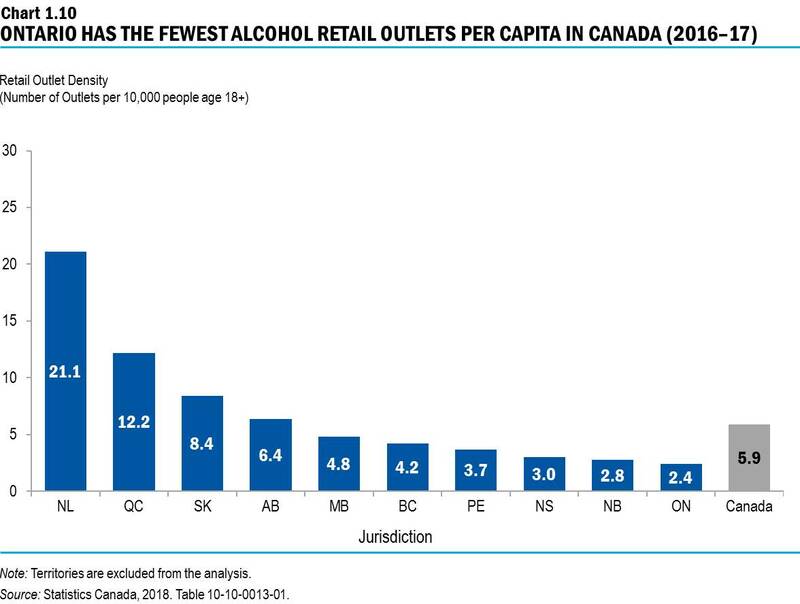 This chart represents the alcohol retail outlet density for all provinces in Canada in 2016–17, compared to the Canadian average. The chart shows the number of retail outlets per 10,000 people age 18+. This chart excludes the territories. The lowest alcohol retail outlet density is in Ontario with 2.4 retail outlets per 10,000 people. Full details of the retail outlet density for each province are provided in the table below.